Pho is a famous Vietnamese broth well flavored and therapeutic, made with roasted bones. Soup was first recorded in the early 1900s, when Vietnam was a French colony. 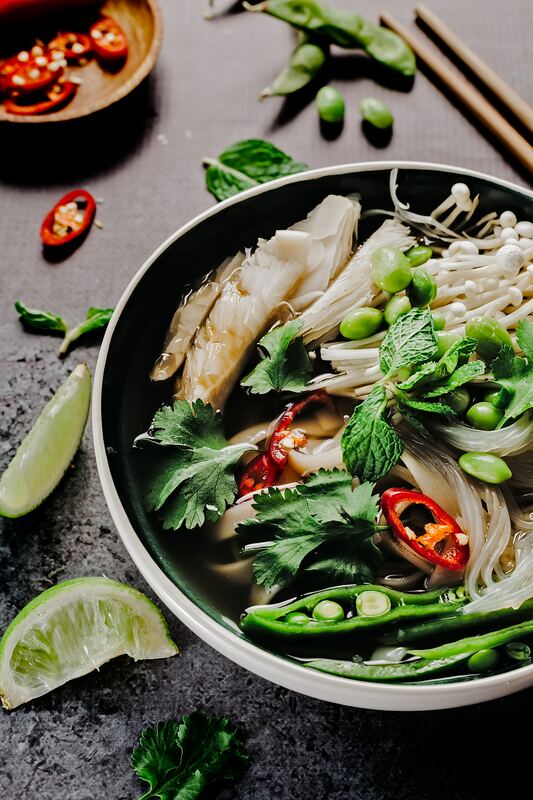 Some say’ Pho’ comes from the French pot-au-feu, while others think they were Chinese sellers shouting’ meat and noodles’, elongating the word,’ phan’, which sounded like Pho. Ultimately, it is about the depth of the bouillon‘s flavor, adorned with lots of fresh sweets. Preheat the oven to 180ºC/350ºF/gas. Crush and slice the ginger. Add in a large casserole dish with veal bones, cinnamon, cloves and aniseed stars. Sprinkle with sesame oil and roast for 2 hours, then transfer the frying pan to the plate over medium heat and cover the bones with 3.5 litres of water. Crush the lemon and add together with soybeans and fish sauces. Then simmer for 2 hours. Skim any fat off the surface and discard (if you make the broth in advance and let it cool, the fat will solidify on top and be super-easy to remove). To make garlic in brine, just peel and finely cut the garlic and put it on a small plate with sugar and a good pinch of sea salt. Add a couple of splashes of boiling water from the teapot, followed by vinegar. Cook rice noodles according to package directions and divide into 6 bowls. Choose the leaves of mint and cilantro, cut the Chinese onion, peel the onion and cut them finely with the chiles. Cut the files into pieces. Place it all in a large bowl with the bean sprouts and take it to the table with the noodle dishes. Place a skillet over high heat and, once hot, season steak with peanut oil, turning every minute for 6 to 8 minutes, or until half raw (depending on the thickness of your steak). If you prefer it half raw, when pouring the hot broth over it you will cook it gently, if desired. Remove the meat on a board, then cut finely and bring to the table with the broth pan. If you’d like to know more about our recipes, please read the following articles.